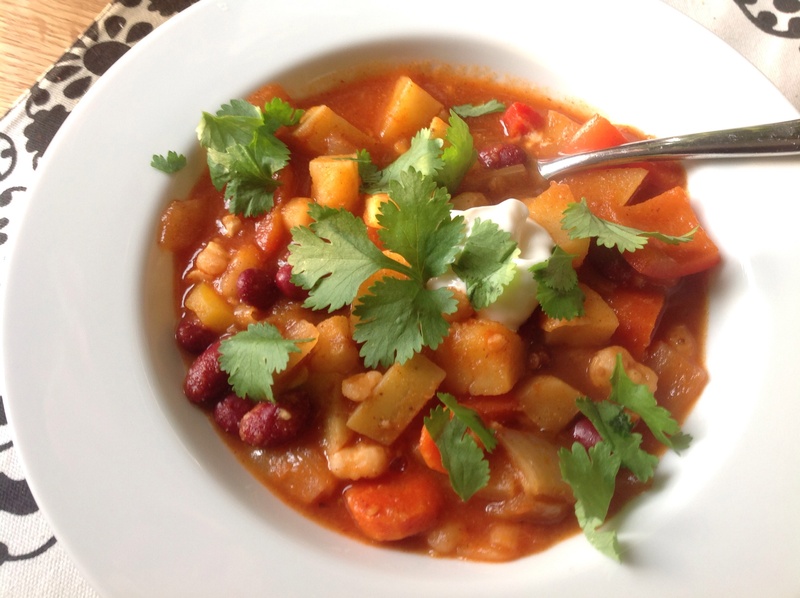 This chili has morphed over the years from a Food & Wine recipe to an undeniable tradition at our house. The original had less spice, less veg, and less oomph. This recipe stands on its own, in your face with more of everything. It’s a great option when you want chili, but not the heavy feeling of the (delicious) meat-packed variety. We typically serve it over brown rice, but it can easily be eaten without it. Top it with cilantro, sour cream, avocado, and/or tortilla chips. You’ll keep coming back for more of this. In a large pot over medium heat, heat the oil. When hot, add the onion and carrot, and season with salt and pepper. Sauté for about 5 minutes, stirring regularly. Add the parsnips and garlic, and sauté for another 5 minutes careful not to let the garlic burn. While the vegetables cook, puree the tomato, chipotle, oregano, and water in a blender until smooth. If you’re concerned about the heat level, add half of the chipotle, puree, then check the spice level. You can add the other half if you want more spice. To the vegetables, add the chili powder and cumin, stirring constantly until fragrant; about 30 seconds. Pour in the tomato mixture and stir to combine. Bring the mixture to a boil, and add the sweet potato, beans and hominy. Simmer the chili, covered, for 15 minutes. Add the red pepper, cover, and continue to simmer for 10 minutes, or until all of the vegetables are tender. Serve over brown rice (or not) with sour cream (or preferably Mexican crema), avocado, cilantro, and tortilla chips.